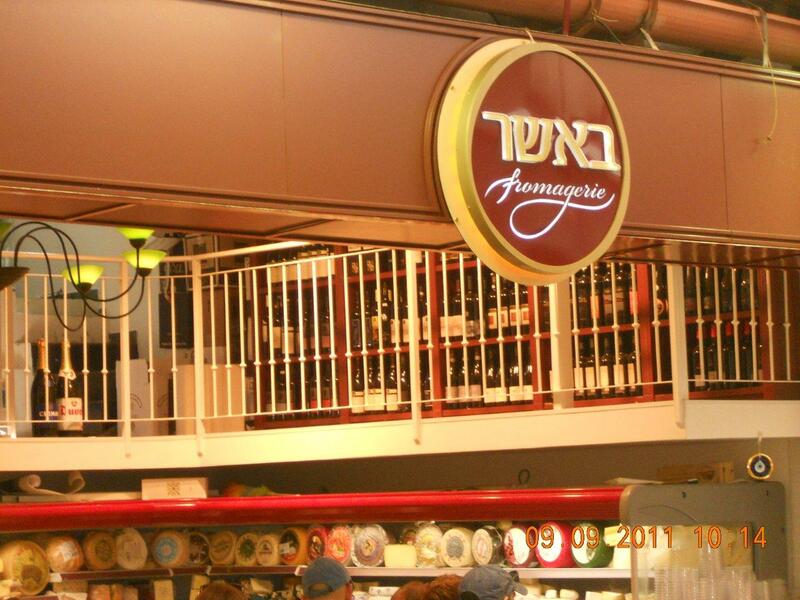 The Chief Rabbinate of Israel Kashrus Enforcement Division (Update 008/ 2 Shevat 5772 – January 26, 2012) writes about the popular Bashar cheese store in Machane Yehuda, “The Shuk” in Jerusalem. The store has no hashgacha from any kosher certifying agency. Second of all, after a growing number of complaints have been received by the London Beis Din, apparently prompting the alert, it has been learned that the folks at Basher tell customers that some cheeses are under the hashgacha of the London Beis Din when this simply is not true. Such cheeses include (in the Rabbinate’s alert) wyke farms, somellow, milk cheddar, village oak fhedder. In essence, the fact that the store has no hashgacha should be sufficient but the masses absolutely feel they must shop in this trendy store because the employees assure them the food is kosher. They are cheese experts and they know is what some consumers told me they are told. What a pathetic situation – that we permit ourselves to rely on this so we can justify buying opened items cut with store utensils in a shop without a hashgacha. Sad indeed. Did you ever wonder why this store sells so many fine imported hard cheeses that are not featured in stores with a hashgacha? Don’t you think the other stores also want to make a living? The store does not have a hashgacha and you should not be buying there. It does not matter who is behind the counter. A kosher-observant Jews must not shop for hard cheese sold by weight is a store without a hashgacha. It is not complicated. The fact that thousands line up to buy there is why hashgacha deteriorates, because neighboring shops that pay money for a hechsher scratch their heads wondering why they are shelling out money since Am Yisrael buys at a store without a hashgacha. Are you beginning to understand? We are the ones undermining our own kashrus. Folks – this is a no brainer. Seeing religious appearing people shopping is not a hechsher. Seeing someone with a yarmulke behind the counter is not a hechsher. This store does not have kosher supervision from any agency. Therefore, you cannot shop there no matter how trendy it appears. Here is a link to another posting on JKN regarding the store from 2010. No need to expound on what has already been written. Posted on January 30, 2012 by JKN Israel. 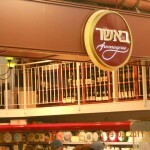 This entry was posted in 5772 - 2011/2012, JKN Alerts, Machane Yehuda - The Shuk. Bookmark the permalink. Please tell us about מעדני צדקיהו. If they are under the Jerusalem Rabbinate, as they say they are, they deserve the support of those who hold by this hechsher. Their cheeses and olives and service are excellent. As always, thank you for your important work. Explain, a grocery store does not have hashgacha but frum Jews shop there! This is not a restaurant, hashgacha is not required. Rather, like when purchasing any non-served food product, hashgacha on the product must be checked. Don’t expand requirements where there are none from the Shulchan Aruch or common practice or you diminish your credibility. YECHIEL: Actually, you are correct regarding grocery stores and supermarkets for that matter. This however is a cheese shop that does indeed sell some sealed items which one may examine to determine kashrus suitability. However, the primary item sold is imported cheeses from around the world, open wheels and chunks, by weight, and these and all other opened items, not factory sealed, which comprise the majority of the store, do indeed require a hechsher so credibility is not compromised here. This is why your work is so essential.I have no doubt that you are the cause,perhaps indirectly,perhsps directly,of this Rabbinate Alert. This has been a problem for a while. I prefer to go to one of the many stores that have a hechsher that sell cheeses. מעדני צדקיהו nearer to Aggripas end of the closed Shuk, בית לחם on Derech Bet Lechem, גפן on Beit Hadfus, and Supermarkets. The main importer of Kosher & Kosher Mehadrin cheeses in Israel is Seyman, and they sell to everybody. Thus there is no reason to buy in Bashar. On the very rare occasion he does bring in a Mehadrin cheese from Europe, but then you need to examine the wrapping and check first with the Kashrut agency. As for the Israeli cheeses, צדקיהו and בית לחם have a much larger selection than Bashar does. The one thing that has bugged me about Bashar is that he doesn’t advise which cheeses are חלב עכו”מ and which aren’t. You have to ask. I have warned many a religious person who has walked in there to specifically ask. I am machmir on this and many people just assume it will be חלב ישראל which isn’t the case. צדקיהו and בית לחם as well as major supermarkets will be happy to tell (as after all they are still Kosher and have rabbinical supervision) and will happily wash the knife in front of you to make sure no חלב עכו”מ is in your cheese. I have asked many a time. As for fish that Bashar has started to stock in order to compete with צדקיהו, the latter sells excellent quality, and all under supervision. And finally, pasta’s, further up on Aggripas is a Rabbanut Mehadrin pasta place, that makes homemade high quality pastas. Why risk it? Avoid Bashar. if the store sells cheeses that are not kosher washing the knife does not help. Based on this article, I would go there to support them. Probably blow a lot of money there too. People need to use there heads. Gotta look at each label there – that’s all. If anybody wants to accuse Basher of being somehow willfully misleading Jews – that is a BIG accusation. I really suggest making absolutely sure before “bringing them down”. Really sure. Reallllllllllly sure. I went on a culinary tour of the shuk two weeks ago. One of the stops was Basher. As it was a group and the other participants, who were not religious, were tasting cheeses, I had a little snoop around. On the closed round cheeses there was some information about the importer in Hebrew but absolutely no hashgacha, not from LBD or Switzerland or France. I asked 3 different people where are the hasgacha labels and they said that each cheese has it’s own some are mehadrin, some rabbanut, some chalav akum etc etc. What rubbish! I know English cheeses and not one of the frum Jews I know would ever consider eating the English cheddars he had there. LBD most certainly does not give them a hechsher. The person that owned the store might look after his dreadlocks but certainly not his kashrut! chaim: You didn’t read my comment properly. I wrote “wash the knife in front of you to make sure no חלב עכו”מ is in your cheese”. I agree that if it was non-Kosher cheese this would be useless, but for חלב עכו”מ which is not actually not Kosher this is fine. Reuven: The Rabbinate found cheeses with fake hechsherim on. Cheeses which no other store stocks. This is wilfully misleading the public. In addition we are in Israel, if the store sells non-Kosher products then they should make people aware. This is not Chutz La’eretz. As an example when I’ve been in Netanya and walked into a store without a teudat hechsher, they’ve told me.